If you're like us, your pets are members of the family. When you can't be at home to look after them due to work, vacation, business trips or other obligations, you want someone you can trust to provide the care and attention they need. That's where we come in. 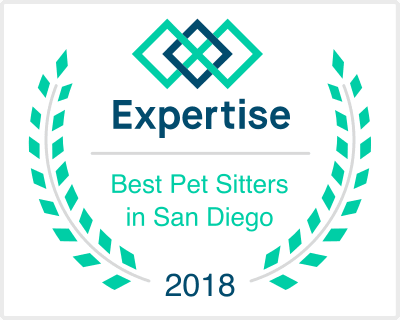 Mission Valley Pet Sitting Services offers you the peace of mind knowing your "furry kids" are in excellent hands. We offer a variety of services for dogs and cats, rabbits, guinea pigs, hamsters and mice and birds. We also care for chickens. All Pet Care Services are provided at your home since many pets do not do well with kenneling and boarding. We are committed to keeping your pets' stress level as low as possible during your absence by providing the same love, care and attention they have grown to expect and get from you. All of our pet care givers are insured, bonded and Certified in Pet First Aid as well as Background checked. I am pleased to announce that one of our wonderful pet sitters, Jenna Jimeno, just had a new baby. We are so happy to welcome Faye into our MVPSS family and wish all of our best o Jenna and her husband Nico.